To make up for a lack of keys, early laptops came with a special function key, the Fn key. This was used in combination with other keys like a Shift key, giving those keys multiple purposes. 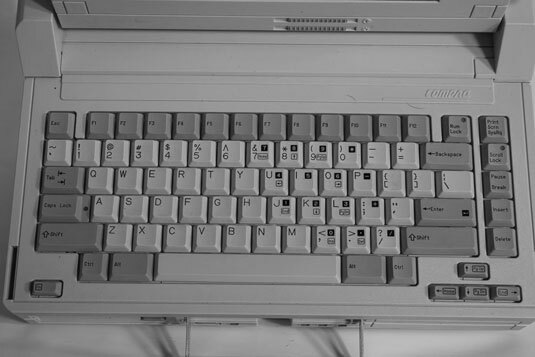 On the old Compaq SLT the Fn (function) key is located in the lower-left corner, enclosed in a rectangle. Other keys with rectangles are activated when they’re pressed with the Fn key. So the arrow keys (in the lower-right corner) double as other cursor-movement keys. Notice how the embedded numeric keypad also becomes an embedded cursor-movement pad as well. What a nightmare! Most modern laptops retain the Fn key, but it’s used primarily to activate special laptop functions. These functions share other keys on the keyboard, typically the Function keys. They’re marked by special icons and are color coded to match the Fn key. Some Fn keys can be rather fun. For example, on the IBM laptop, Fn+PgUp is used to turn on a tiny keyboard light in the laptop’s lid.